Nothing is quite as rejuvenating as a dry sauna. Based on our dry sauna reviews, we handpicked the best dry sauna for you. In contrast, a traditional sauna uses steam to draw out toxins a dry sauna uses pure heat to alleviate tension, revitalize the skin through sweat and increase blood circulation. In both North and South America, the indigenous people used sweat lodges for both ritual and medical purposes – the concept of a dry sauna is pretty much the same. In a dry sauna, the heat is far more bearable than in their wet counterparts. The advantage with dry saunas is they don’t use steam so the body is in direct contact with the heat drawing toxins out of the body faster. They also have a famous reputation of aiding quelling chronic pain. Health and beauty benefits aside a dry sauna can just leave a person feeling like a fresh sheet in the wind. The bulk of today’s dry saunas use infrared heaters so the heat is in a direct line with you versus the traditional sauna where the heat would have to rise to the top of the room and then slowly move down. This also makes the sauna feel like it is heating up quicker. With the great variety of dry saunas, it took a lot of hard work to create this list of the 10 best dry saunas. With Clearlight saunas having 8 entries on the top 10 best dry saunas it should be any shock that they steal the number one spot. 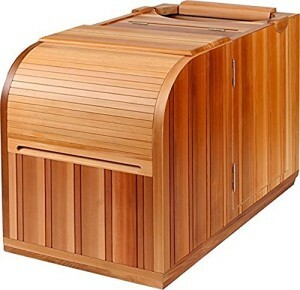 This solid red cedar sauna fits 3 people, has interior/exterior lights and controls, radio/CD player, MP3/blue tooth port, in short this sauna is loaded. You get what you pay for; you get a lifetime warranty with customer service in the US. This beautiful corner sauna can easily fit into any large bathroom using infrared heaters and solid cedar construction you’ll have decades of solid performance. 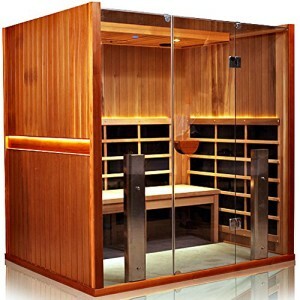 With color light therapy, adjustable vents, magazine rack, cup holder and oxygen ionizer this sauna is loaded with great extra’s, this is worth the investment. 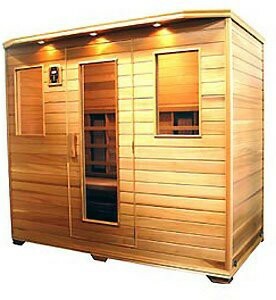 The noticeable price difference in this sauna is because it is made from finished Nordic spruce. This is only a big deal if you’re going to be exposing your sauna to the elements. Since this is intended for indoor use that shouldn’t be a problem. 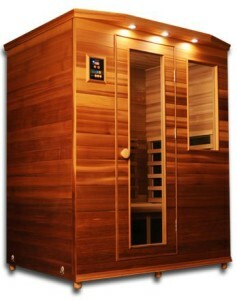 Also, if you’re one of those rare people that dislike the smell of cedar this may also be the sauna for you. For a three person sauna, this is a steal. This tiny one person sauna doesn’t have much in the way of frills and it looks like an old school sauna that you might see in an old three stooges’ movie –it’s a wood box that your head sticks out of. So Health Mate’s sauna not having a TV or radio built in is not a big deal. 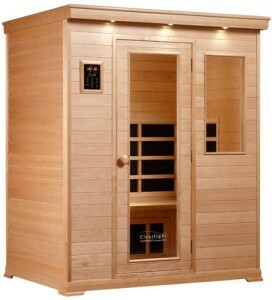 As a one person dry sauna it is at an unbeatable price. Also given the small size you could easily put it on wheels or if you are planning a move then you are not looking at hours of disassembly and packing of this small unit. At the number 5 spot on the 10 best dry saunas is giant 5 person sauna. The interior alone is more than six feet across. This is the only 5 person sauna on this list and wet or dry there aren’t a lot of saunas this big made out there. This huge space is made from cedar and comes with the typical standards such as reading lights and sound system. Being that there aren’t a lot of 5 person saunas out there this is a fair asking price… While sauna gets hot fast but there is a snag to the super-fast heat: The unit has a 240v plug. What that ultimately means is that you are going to have to call an electrician to come and install the same type of electrical outlet you typically see for a washer or dryer. So short version is you cannot plug it into a regular wall socket. So you do have to your final cost a certified electrician coming out to your house and making adjustments to your wall socket. 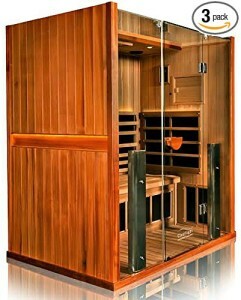 Thera are a lot of pros with this 3 person sauna, it’s made from red cedar, gets hot fast and has a 100% lifetime warranty. The big downside to this item is that it runs on 240v. This is a bit much for a 3 person sauna that also asks that also have to pay for an electrician. This is a well-built item. It has an audio and charging station and tablet cradle so you can watch movies, listen to music etc. Of course, while this sauna is well made there is the catch that it runs on 240v power. 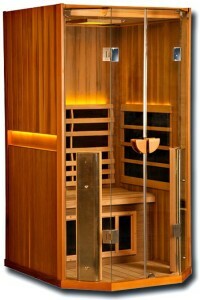 The design is made for a corner fit however you can find just a room 4 person dry saunas. This one person sauna as an elegant design and just a great deal of amazing planning that went into the particulars. One of which is the programmable timer so you can have your sauna ready and heated up for you after work. The doors are designed so if you want to look out of your sauna you can –such as to watch TV. It makes it to the number 8 spot because it has a very high asking price for a one person sauna. This beautiful and modern sauna has an awesome open look and feel to it. Much like the 4 Person Corner Sauna ClearLight Sanctuary C-FS and 4 Person Corner Sauna ClearLight Sanctuary C-FS this also runs on 240v so you’ll also need an electrician to install this unit as well. At six feet across this sauna seats 4 and is room and big. For the luxury that this sauna offers it demands that you pay for it plus the cost of an electrician to come out to your house. Yet, that also buys you a complete 100% lifetime warranty. Placement on this list wasn’t created by massive faults; it was created by tiny details. All the Saunas on this list are good. 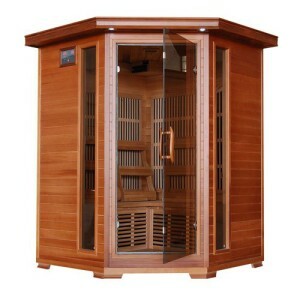 This 4 person corner sauna made from Red Canadian cedar looks great and has lots of nice extras such as internal/external keypads, mood lighting, radio/cd player with mp3 blue tooth jack, and 2-way speakers it makes to this list –however last place on the 10 best dry saunas… Which at least is on the list but it is the price tag that gets it here. Of the 10 best dry saunas this list really is the best remember it was slight details that set the order and all of the saunas on here are excellent.